This post is a slightly modified transcript of a talk I gave on celestial navigation. As some of you know, I like to build things, and I recently decided to build some classic navigational tools. Of course, in the process of building these instruments, I had to learn how they work. The history of celestial navigation is fascinating and deeply connected to the history of astronomy and mathematics. The original slide show can be found at the bottom of this post. Enjoy! I’m going to begin with a seemingly simple question, then hopefully give you some basic tools to answer that question. Where are you? Today it seems rather trivial. We have a host of technologies available that allow us to precisely pinpoint our location in the world. Even without the smart phones and GPS network, we still have reliable road maps, decent signage, and large easily recognizable landmarks. But what if we didn’t? Pretend for a moment that you’ve been blindfolded, spun around, and dropped somewhere in the world. You have no reference point, no maps, no landmarks, and, to make things just a bit more difficult, you’re floating on an ocean that’s constantly moving, so you can’t even maintain a stable position. This is the challenge mariners faced since we first left sight of shore. So now I’ll ask you again, where are you? It’s ok if you don’t know, we’re going to figure it out together. First, I have to assume you’re on Earth. If you’re not on Earth, you’ve got bigger problems to deal with. The next step is figuring out which hemisphere you’re in – the Northern or Southern. This may seem trivial, but with no GPS, maps, or even landmarks, how do you know which side of the world you’re on? Obviously, since this is a post about celestial navigation, you have to look up. If you’re lucky enough to be in the Northern Hemisphere, you’ll probably recognize Ursa Major and Ursa Minor (the big and little dipper or the two bears). If you’re in the Southern Hemisphere, you’ll probably recognize Crux (the Southern Cross) and maybe Centaurus. I say it’s lucky to be in the Northern Hemisphere because what you’re actually looking for is not a star, but a fixed point in the sky. The planet is spinning, and because the planet spins, the stars in the sky appear to rotate in a circle. If you’re moving, and the stars are moving, you can’t use them as a guide, either you or the stars must be stable. There are two points in the sky that don’t move, the Celestial Poles. These are the points in the sky that fall along the line of the earth’s axis of rotation. In the Northern Hemisphere, there is a star, Polaris, that falls almost exactly at that point. In the Southern Hemisphere, there is nothing to mark the southern celestial pole. You can still find the southern celestial pole. The Southern Cross points directly at the celestial pole. 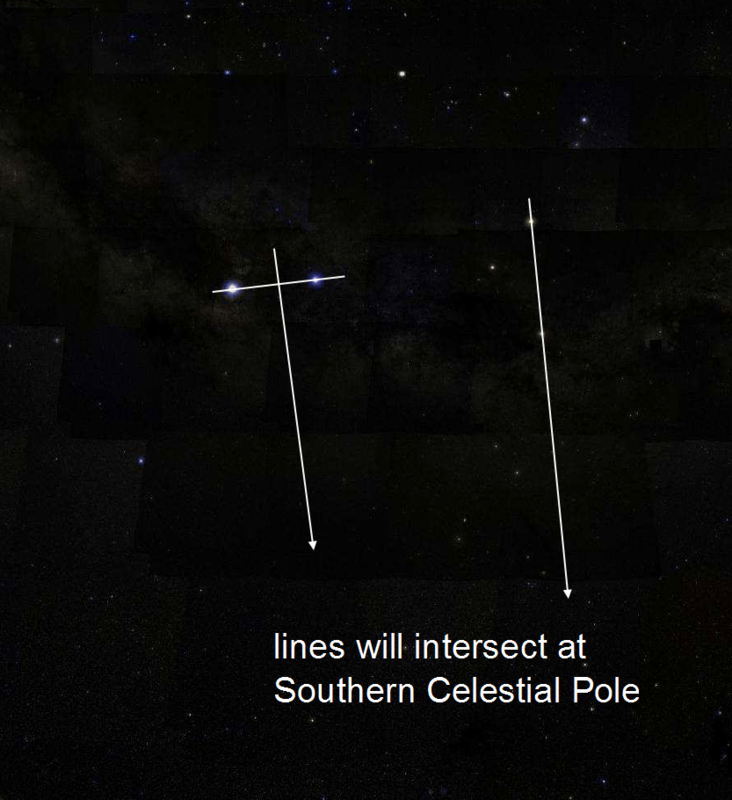 If you draw a line through Crux, and draw another line that bisects a line between the two brightest stars in Centaurus, those two lines will intersect at the southern celestial pole. We’ll assume I’ve dropped you in the Northern Hemisphere. All the tools I’m about the give you will work just as well in the Southern Hemisphere, they just have to be adjusted to account for the difficulty in finding the celestial pole. Before mariners had a coordinate system, they developed tools which allowed then to travel in a straight line (east/west) and find a port-of-call. 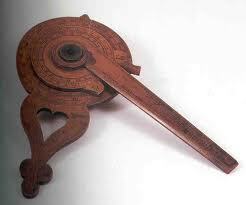 The simplest and earliest known navigational tool is the Latitude Hook. The Latitude Hook can be as simple as a stick broken to a specific length. More complex hooks used a loop sight and a cross piece. Latitude Hooks are simple to use, provided you can find the horizon and Polaris. To build one, hold a stick out at arms length, line up the bottom with the horizon and cut the length of the stick so that Polaris rests right at the top. From now on, as long as the stick is held at arms length, the horizon is at the bottom, and Polaris sits at the top, you will maintain a constant Latitude. The Latitude Hook also acts a simple navigational aid. If Polaris is too high, you’ve gone too far north, it it’s too low, you’ve gone too far south. Build a Latitude hook for a specific location, and you can always find your way back to that location. Not surprisingly, the Latitude Hook is a simple tool to measure and maintain constant latitude. So how does it work? 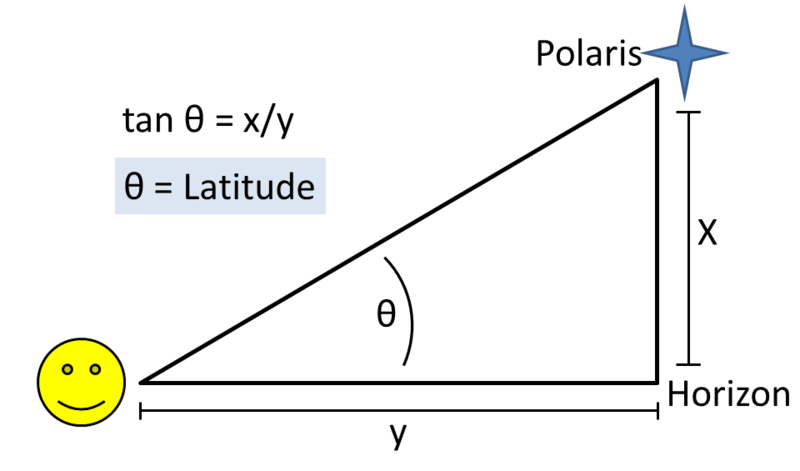 Three points – Polaris, you, and the horizon – form a right triangle. If you know the length of your arm and the height of the Latitude Hook, you can solve for the angle formed by Polaris, you, and the horizon. We have a special term for that angle. It’s called Latitude. If you replace your Latitude Hook with a ruler, you can use it to calculate your latitude anywhere in the world. This method is accurate to about 1 degree of latitude, or 60 nautical miles. Not bad for sighting off of an object 430 light years away. This principle – the angle between Polaris, an observer, and the horizon equals latitude – is the foundation of almost all navigational tools. Almost all other navigational tools are simply improvements on this core concept. Cross Staffs are adjustable and have a slide rule on the staff to read your latitude. Quadrants and Astrolabes rely on gravity so that you don not need to see the horizon. Octants and Sextants use a series of mirrors to correct for ocular parallax and put the north star and the horizon on the same plane. All these tools have other functions as well, but their fundamental use is determining latitude from the altitude of Polaris. So that’s latitude, but latitude is the easy one. For nearly all of recorded maritime history, longitude was impossible. Columbus crossed the Atlantic and successfully returned home without ever knowing his longitude. Various rulers of Spain, France, Portugal, and England put up the equivalent of billions of dollars in prize money to whoever could figure out how to accurately determine longitude at sea. Galileo came up with a truly ingenious way to determine longitude, by calculating the orbits of four of Jupiter’s moons. Unfortunately, the Jovian system requires a stable observation point, a decent telescope, and the ability to do math – three things most mariners lack. But the Jovian system was a necessary step towards the ultimate solution to the problem of longitude – time. The planet is spinning, and because the planet spins, the stars appear to rotate above us in a great circle that takes exactly one day to complete its rotation. Lines of longitude run parallel to the axis of the Earth’s rotation. This means that there is no fixed point in the sky to use as a guide. This ultimately means that longitude, despite being a coordinate in space, is practically a function of time. The time the sun peak, in GMT, at your location. Numbers 1 and 2 are known variables, all you need to do is determine the time the sun peaks at your location. If, for example, you live on the East Coast of the United States, and the sun peaks at 1700 GMT, then all you have to do is subtract 1200 from 1700 and multiply by 15 degrees for every hour – congratulations, you’re at 75 degrees West. The more accurate the sight on the sun, and the more accurate your clock, the more accurate your reading will be. The most accurate maritime clocks were chronometers, and they changed the way we travel across the sea. But wait. You’ve been blindfolded, spun around, and dropped in the middle of the ocean. You don’t have an accurate chronometer and you certainly don’t know what time it is in Greenwich. So how can this information possibly help you? Even if you don’t know your absolute longitude, you can still determine you relative longitude to determine how far you’ve traveled east/west. To begin, this is not a very accurate method, but over a few days it will give you a rough idea of whether or not you’re making headway. First, locate a star on the eastern of western horizon. Measure it’s altitude at the exact same time every night. Changes in degrees with correspond to movement east or west. As a matter of fact, you do have a clock. It’s above you. Recall again that the earth is spinning. And because the Earth spins, the stars appear to spin. Not just spin, but spin around a fixed point in the sky and make one complete rotation every day. What this means is that the night sky is an enormous, 24-hour clock face. All you have to do is figure out where the hands are. Fortunately, mariners have developed a tool to do just that, the nocturnal. A nocturnal works by determining the angle between Polaris and either Ursa Major or Ursa Minor. Calibrated for date, you can tell the time to within a quarter hour, good enough for relative longitude. Simply sight Polaris through the center of the Nocturnal, set the date to the current day, and rotate the arm until it lines up with the pointer stars of Ursa Major or the Guards of Ursa Minor. You can make you own nocturnal here. So now you should have a pretty good idea of how to determine your location and find your way home, even if all you have are a few sticks. Some people have done just that. Steven Callahan spent 76 days adrift in a life raft after his ship sunk in the Atlantic. Using nothing more than three pencils lashed together, he managed to track his location over 1,800 miles and was never off course by more than a degree. Finally, it make surprise you to learn that these tools and techniques were not created by mariners, but rather astronomers. The history of exploration, which is really the history of the human race, traces its origins to a few curious minds interested in finding the altitude of Polaris and charting the motion of the stars. We know where we are in the world because we want to know where we are in the universe. 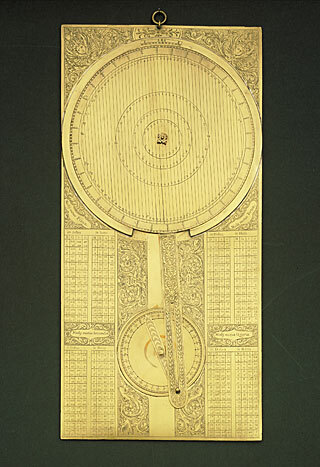 This post gives a great outline of navigational astronomy before the mid-eighteenth century, but why did you stop before they worked out the solution to the longitude problem using the lunar distance method? With the data provided by Greenwich Observatory, mariners were able to find out both their local time and the time at Greenwich, not just relative longitude. Sailors can still do this today, as the Nautical Almanac is still published. At the end you say that exploration was made possible by the few curious minds that worked on this astronomy. That’s not quite how it works. The work of most of these astronomers was made possible because it was relevant to navigation. Thanks for your comment. The answer to both questions is more pragmatic than stylistic – the original presentation was 15 minutes long and done for a group of scientists. I simply didn’t have enough time to get into lunar distance. While some of the work was funded with the idea that it would benefit navigation, many of it was not. Both the quadrant and astrolabe weren’t well suited the ocean work. Columbus reportedly found his quadrant more trouble than it was worth and da Gama had to come ashore every time he used his astrolabe. It wasn’t until the backstaff that these tools were being made specifically for navigation. Understood! I suppose my view is skewed by working at the Royal Observatory, Greenwich, an institution that existed entirely for the improvement of navigation, although it did some pretty important astronomy too. Fascinating. But one question: if you’re on a boat, how can you account for the motion of the seas? I imagine it would be very hard to keep the latitude hook steady enough (relative to the horizon) in order to find the location of polaris relative to the latitude hook – at least without the kinds of fancy stabilizers that ships have nowadays. Wait for a calm, clear night. It ain’t easy. On a boat, one sights the horizon by holding the instrument steady and “swinging” it from side to side like a pendulum. The instant you find the lowest point on the pendulum, you know the sighting device is perfectly vertical, and you take your sight at that moment. Sextants use split mirrors to make this somewhat easier, but it’s still tricky. In any case, you don’t have to wait for a calm, clear night – though of course calm conditions do generally lead to more accurate sights. Have you heard about all the sailing done in Hawaii. The Hokule’a has been from Hawaii to Easter Island and all over the Pacific as a floating school teaching youngsters all about the ways of celestial navigation. They also teach the kids how to use seabird and fish, also currents the way the ancient Hawaiians did. A few weeks ago, I read an article on Time magazine’s website entitled “Ten things children born this year will never experience”. One was “being lost”, thanks to tools like GPS. Crazy to think about. Celestial navigation is awesome, I wish I could have seen your talk. Given that the earth is also translating in an orbit around the sun, what is theoretically the best possible resolution of location possible using a sextant under ideal conditions and making your computations with the benefit of an almanac? Thanks.